WESTBROOK- Waterstone Properties Group, Inc., a Needham, Massachusetts-based real estate development company, announced that Rock Row will be the new name for the 1 million-square-foot, mixed-use complex the company is developing at the former Pike Industries quarry near the Portland-Westbrook border. The site will embrace the 26-acre quarry as a natural centerpiece and foundation, combining elements of destination retail, urban living, modern workplaces, vibrant hospitality, entertainment, dining, wellness and recreation into one immersive experience offering something for everyone. Rock Row will welcome Market Basket Supermarket as its first tenant, having already broken ground and opening summer 2019. The development benefits from a collaborative partnership with the city. In March, the city council granted a tax increment financing (TIF) agreement, which will provide a financing vehicle for the equivalent of $12 million in public infrastructure costs. Through the TIF agreement, 50 percent of the tax generated at Rock Row over a 25-year period will go directly to the city, helping to accelerate economic growth throughout Westbrook. At full build-out, the 100-acre project will include over 1 million-square feet of commercial, residential, and hospitality space, which will generate well over 1,000 permanent jobs in addition to 1,500 new construction jobs. This plan includes 750 apartments, a mix of studio, 1-, 2- and 3-bedroom units, with the first 250 units anticipated to open in the fall of 2020. 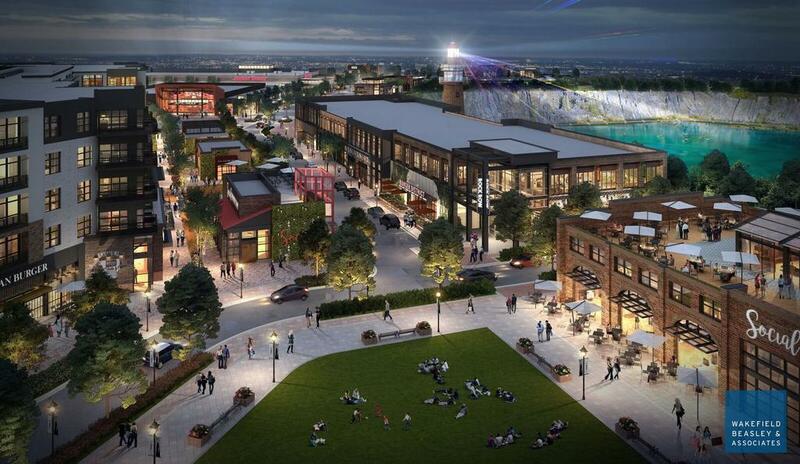 Rock Row will also be home to 400,000-square feet of office space including a 100,000-square foot medical and wellness campus and 450,000-square feet of retail space, including shops, restaurants, interactive experiences, a movie theater and a concert venue. Waterstone is also curating a world-class brewery and food hall experience in partnership with The Colicchio Group. This 25,000-square foot indoor/outdoor facility will make it possible for local vendors to showcase the best the region has to offer in craft brewing, distilling and culinary experiences. For those who prefer spending time outdoors, Rock Row will also provide numerous ways to stay active, including offering access to lake recreation and a network of walking, biking and running trails interconnected around the quarry and into the community’s surrounding trail networks. Full buildout of Rock Row is slated to be completed by 2022.